If you follow my jewelry Pinterest boards you may notice it has been filling up with turquoise inspired pieces. A few weekends ago I went on a little antiquing adventure and I discovered this ammmmazing turquoise jewelry shop. Everything was stunning. I wanted to see how much this one piece was so I asked the shop owner if he could open the case. I did the whole... let me "inspect" this piece...aka look for the price tag. Ahhh $400! Bummer. Is that how much real turquoise costs? Geeeese Loiuse. I was determined to recreate it using polymer clay. This site gave me some great direction as far as making it appear more natural. Polymer clay. I mixed the two colors above to give it a little bit more of a greenish blue tone. Gloves. Unless you want sand and acrylic paint embedded in your fingers. Mix the two colors together. Place sand and a few tiny squirts (hate that word) of paint in the bowl. Mix everything together and really work the sand and paint into the clay. Its going to look like a big ole mess but trust me it comes together. Decide on the shape and mold it. If you plan on making your piece into a pendant, poke a hole through it with a toothpick. Bake for 20 min at 270 degrees. If you are like me you might be asking yourself.."Isn't acrylic paint flammable?!!" After a quick google search I discovered it's not. I wasn't convinced so I had baking soda and a pot ready to go just in case. I learned this is how you put out an oven fire. Good to know. Using the sander, sand away until you start to see the black veins pop through. I covered it with a layer of Mod Podge to give it a more finished look. You could also use clear nail polish. Mr. Opinion (my husband) told me it looked like a pile of mush. Sweet right? I showed him my inspiration and he still didn't get. Haha. On a side note: a little shout out to one of my best friends who opened up her first Etsy shop! It is full of adorable crochet creations. You can check it out here. this is so cool! what a great way to just make what you want! This is so pretty! You should open your own etsy shop with all of your polymer jewelry creations! Turquoise is not only one of my favorite colors but it is also my favorite kind of jewelry. I second Sherri Lynn on the Etsy store. I know I've mentioned it before but you are awesome w/ clay! That is incredible! I would never have thought that was possible with that sort of clay it looks so pretty! :) You win! haha husbands really don't "get it" lol. I remember one time I tried on a flowy cream colored dress & when I came out & asked my husband if he liked it he said that I looked like "a chubby marshmallow" & asked why I was wearing a dress 3 sizes too big for me .. men & fashion lol ps looove the turqoise I actually just posted about it yesterday :) have a great wednesday!! WOW! You are amazing girl...who would have thought to do this?? :) LOVE! hello I'm back. So good to see your creative projects again. Love it! What a brilliant idea. I love turquoise too. And this is definitely inspiring me! Oh my goodness, it looks so great! I'd totally wear that necklace -- so crafty! Hello! This is genius! I am so not creative...so glad I follow a ton of blogs that fill my mind with inspiration. Now if I could just put that inspiration to work! I think that's AMAZING!! I had no idea all of the things you could do with clay! You have opened my eyes to a whole new world. haha! LOVE IT! My husband would probably say the same thing, but they just don't get it do they!?!?! I think its time for you to open an etsy shop so i can buy EVERYTHING! I love it! I love all things turquoise and was lucky enough to get a fabulous turquoise necklace down in Mexico this spring. But turquoise is so expensive, and I think this is a beautiful alternative. LOVE IT! Your husband is totally wrong - this definitely looks like turquoise! Dangit! This is awesome. It looks really, really good. So pretty...and I love the swirls and texture of it. Gorgeous piece! Wow, how cool! I'm so amazed at your clay creations! Looks just like turquoise (my fave too!). How creative of you ! It is a pretty stone and a whole lot less expensive than real turquoise. hey lindsay this is great!! im so glad you stopped by my blog...i love yours. now following! This looks cool! Love turquoise right now. LOVE!! Oooh my i need to try this!! SO cute!! this is so fun. i will have to try it out! I had no idea this could be done. It looks great. This is really beautiful! I love it! We are doing 5 Days of Giveaways on our blog this week if you or any of your readers want to stop by and get entered to win! Wow, I never would have thought to do this, it looks real! I love the Mod Podge effect on it too. I will definitely have to try this! That looks very real! Great job. That is the opposite of a pile of mush! It looks fab! i think it turned out beautifully! 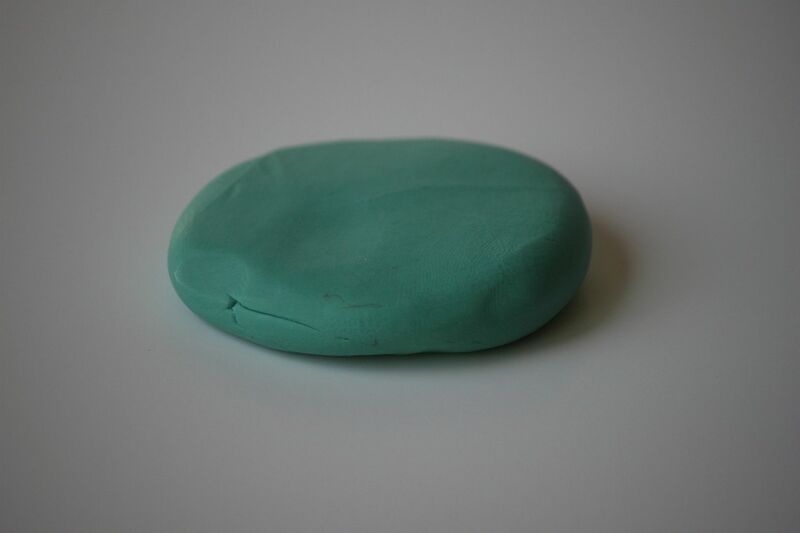 it looks like turquoise to me. Amazing! Looks gorgeous! You're so creative! Super cool! I love all of these fabulous clay things you share with us!! That is really neat! My grandpa was obsessed with Indian Reservation jewelry and turquoise and acquired a pretty large collection. When he died, my mom and I got some of it. I love turquoise, but like you, not the price tag. I'm going to try this out and see how it compares to the pieces I own. I love that! So neat! 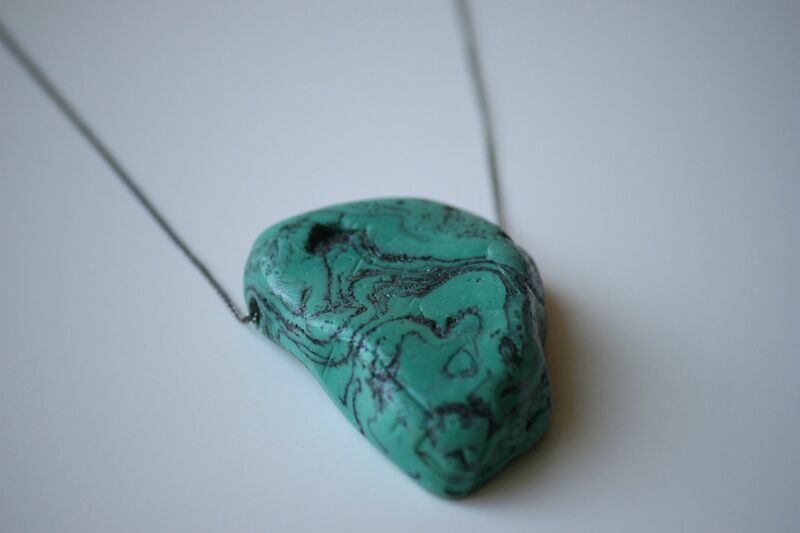 i think it looks great, even if people might not think it's turquoise, it's a cool piece you made yourself! and most fake cheap turquoise pieces from stores like forever 21 don't look real anyway! You're a genius. Seriously :) This is amazing!! Very cool! I'm loving the turquoise stuff too. I actually took your polymer clay bracelet idea and made a "tourquoise" and "copper" bracelet. You should check it out! You make the coolest things. Thanks for sharing! That is GORGEOUS! What a stunning replica! I am super impressed with your skillz. Tell your husband he'll be getting a pile of mush for dinner for the week. How pretty! Thanks for the lovely comment; the necklace wasn't my birthday, but it was from a giveaway win :). I think that is a really cool DIY project. I might have to give it a try. I know my daughter will me amazed by this. you are amazing! everything you make i want to make! Hahaha, my boyfriend gives me his opinion about some of the things I make - like the bib necklaces that he 'doesn't get' and the felt brooches that he 'can't believe people buy'! hahaha. Helpful males! Great idea though and I love that you did your fire prevention research! HOLY CRAP THATS SO COOL! Thanks so much for the tutorial, I'm bookmarking this page to add to my "DIY TO DO" list! Thats really neat! I absolutely love it. Great job. 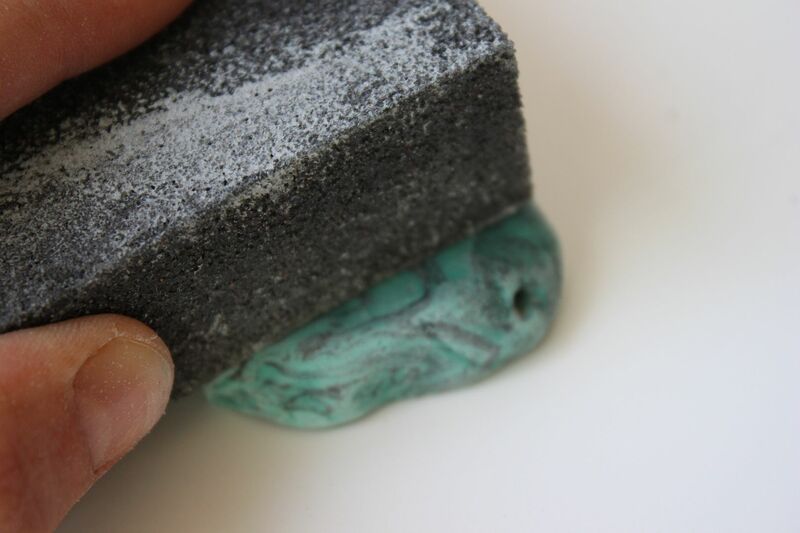 I never thought of using sand and paint in my clay to create cool jewelry. Thanks for the tip and inspiration! Would never have thought of anything like that. Turned out absolutely adorable! Loveee it! I def wanna try this. Oh my word how pretty is this! I am definitely going to have to give this a try! Thanks so much for sharing. I am your newest follower. This is incredible, it looks like real turquoise. I seriously cannot believe your talent sometimes! Both my grandparents (true blue desert people) collected turquoise jewelry their entire lives so I'll be inheriting some of those pieces, I'm sure. But I just love, love, LOVE the color and texture! It's so earthy and simple. Anyway, I love this project. I really want to try it. I will learn to type someday. wow! this is so impressive! thanks for the info! I am SO glad I just discovered your blog! I love it so much! AMAZING! I love it...definitely not a pile of mush. :D You make the most beautiful things!! AMAZING! Pinning! Found you through Design it Chic and very glad I did! Great Blog! Following via the blog hop. new follower! this is so cool - it looks really legit! i would never be able to tell it wasn't real turquoise. 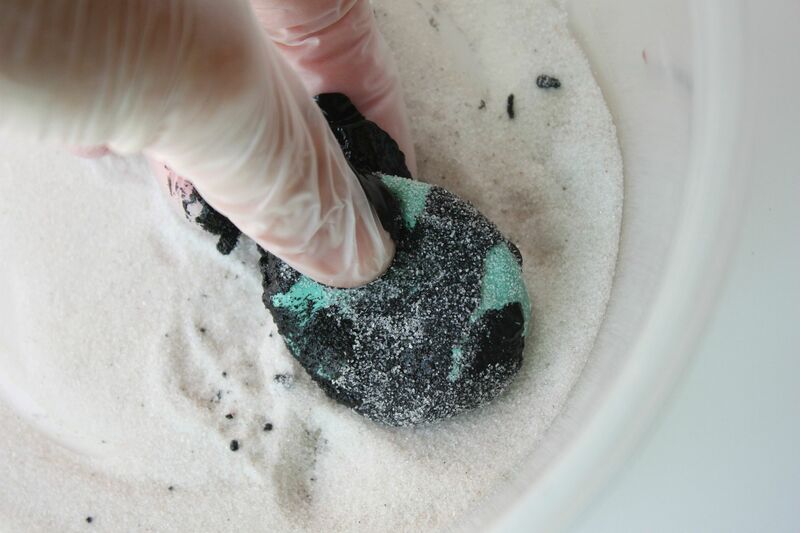 as a turquoise lover myself, i definitely need to start making my own - it is soo expensive! WOW! How do you come up with these ideas girlie? That is sooo impressive! All of your blog posts are sooo inspiring...you are SO fashionable, such a perfect mom and wife, amazing chef, and amazing writer too! I just LOVE your blog! I don't think you were wordy at all. I love learning about people. Is that a nice way of saying I'm nosey?? What an amazing person you are!! I blog because I've always been someone that has a journal/diary that was more like a scrabook & I stopped when I got married. I thought a blog would be a good replacement & my bff talked me into it. I've bought a small stash and I'm going to get down to business. I love it! I think I might try that out....someday. Just a recommendation, polymer clay should not be glazed with clear nail polish. The two materials are incompatible. The nail polish will not dry completely. 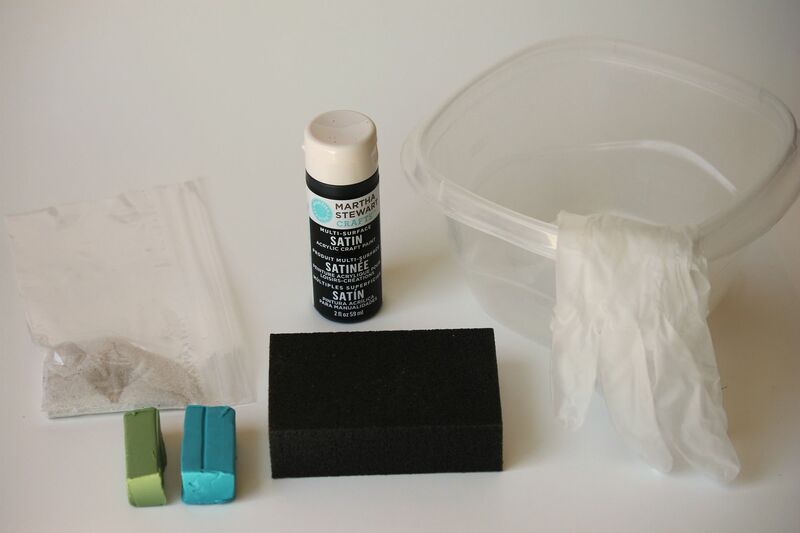 It is better to use modpodge or water based polyurethane. You can also sand with a fine grit sandpaper and then buff with a piece of denim.